This curiosity led Nistha Tripathi to pursue these founders, who rose from humble beginnings yet made a dent in the Indian start-up universe, including a couple of founders from the Silicon Valley. This book is a record of her 18-month odyssey. 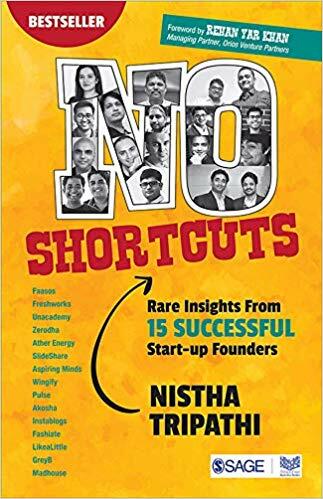 In her incisive one-on-one interviews with 15 ambitious founders from India, including Girish Mathrubootham, Nithin Kamath, Jaydeep Barman, Gaurav Munjal and Tarun Mehta among others, Nistha uncovers the decisions and insights that led these start-up founders to find their unique roadmap to success. One thing underlined all the stories—the founders’ belief in ‘No Shortcuts’. Read the never-heard stories of Freshworks, Faasos, Unacademy, Zerodha, Slideshare, Pulse, Aspiring Minds, Madhouse/Morpheus, Akosha, Ather Energy, Instablogs, Greyb, LikeaLittle, Wingify and Fashiate.